The president’s body was brought to Love Field and placed on Air Force One. Before the plane took off, a grim-faced Lyndon B. Johnson stood in the tight, crowded compartment and took the oath of office, administered by U.S. District Court Judge Sarah Hughes. The brief ceremony took place at 2:38 p.m.
On November 29, 1963 President Lyndon B. Johnson appointed the President’s Commission on the Assassination of President Kennedy. It came to be known as the Warren Commission after its chairman, Earl Warren, Chief Justice of the United States. President Johnson directed the commission to evaluate matters relating to the assassination and the subsequent killing of the alleged assassin, and to report its findings and conclusions to him. 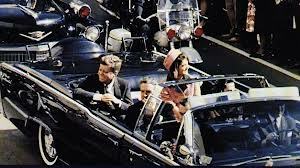 The U.S. House of Representatives established the House Select Committee on Assassinations in 1976 to reopen the investigation of the assassination in light of allegations that previous inquiries had not received the full cooperation of federal agencies.